The FDIC published a press release on October 3, 2018, to announce the addition of the new page. 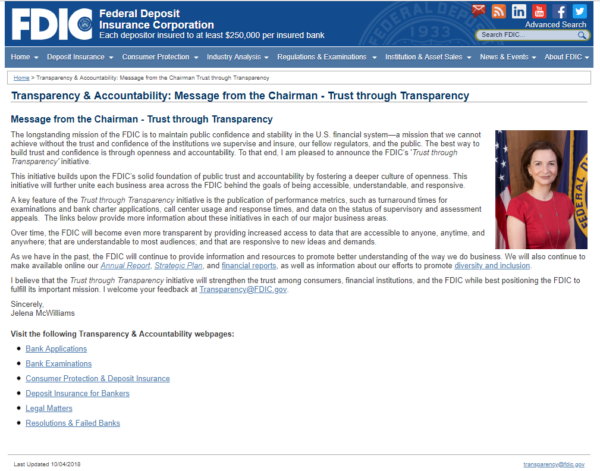 Jelena McWilliams,Federal Deposit Insurance Corporation (FDIC) Chairman, announced an agency-wide initiative called,”Trust through Transparency.” She made the announcement at the 2018 Community Banking in the 21st Century Research and Policy Conference, located in St. Louis, Missouri. “Like any asset, trust must be earned and then preserved. In my view, the best way to maintain a trusting relationship is to be accessible, understandable, and responsive — to provide your stakeholders with the information and means to hold you accountable,” Chairman McWilliams is quoted as saying. “Instead, we must strive to be accessible to financial institutions, consumers, and the general public; understandable to most audiences; and responsive to new ideas and demands,” Chairman McWilliams said.